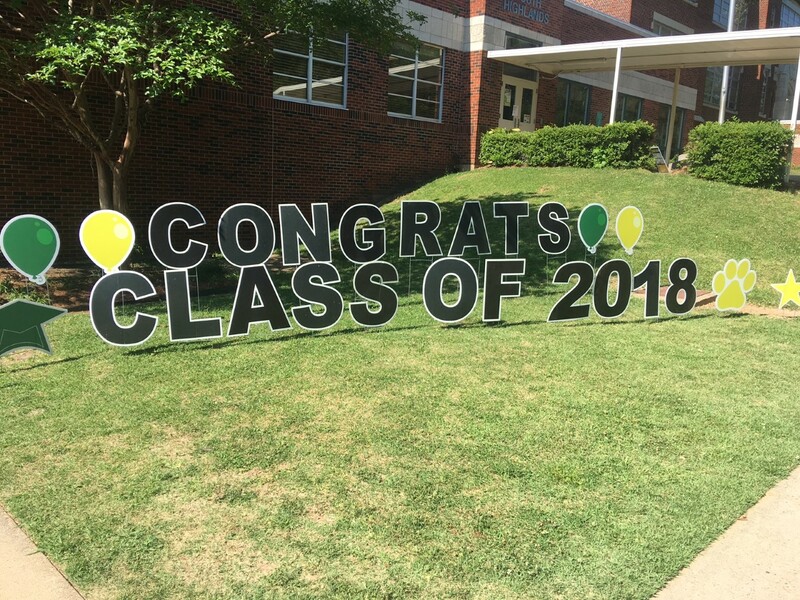 FROM THE PRINCIPAL’S DESK: We Did It! We made it!!! Another magical year has come and gone at South Highlands. Thank you to all of you who have made this year such a success, especially to Amber Ballis and Jen Veluvolu who served as our PTA president and South Highlands Foundation president. I enjoyed every minute serving alongside these dedicated and awesome ladies, as well as every other committee head and board member. Thank you to the best teachers and faculty in the state who pour their hearts and souls into loving and educating our children. 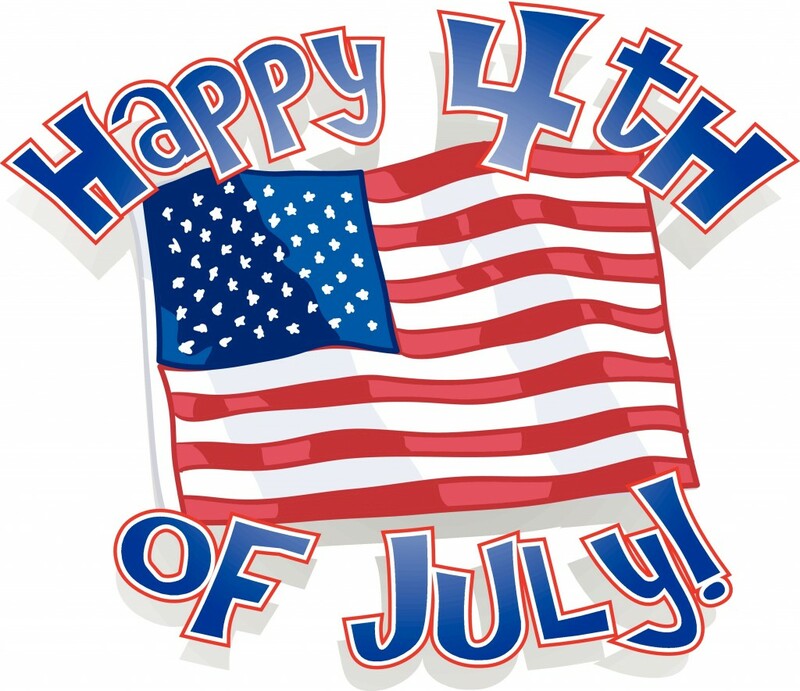 We hope everyone continues to have a safe, fun and spectacular summer filled with laughter and love. 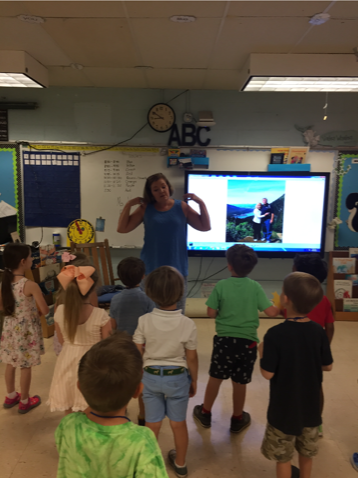 As you enjoy your summer, we have already begun a new year at South Highlands by welcoming and loving on our incoming kindergarten class through “Cub Camp.” What a fantastic time we had getting to know our new little Tigers. They are precious! We look forward to welcoming them again in August along with all of our “seasoned” families! 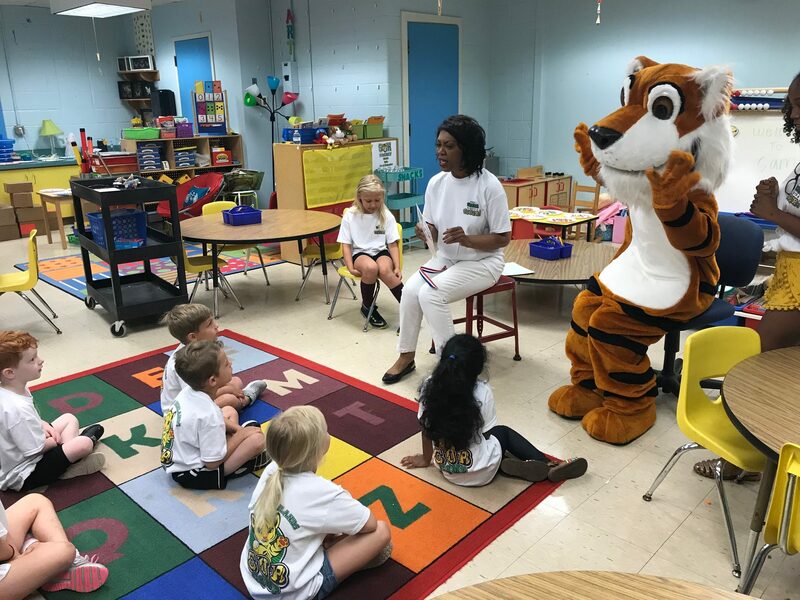 SHM’s newest Tigers, the Kindergarten Class of 2018-19, began their journey into elementary school at Cub Camp. 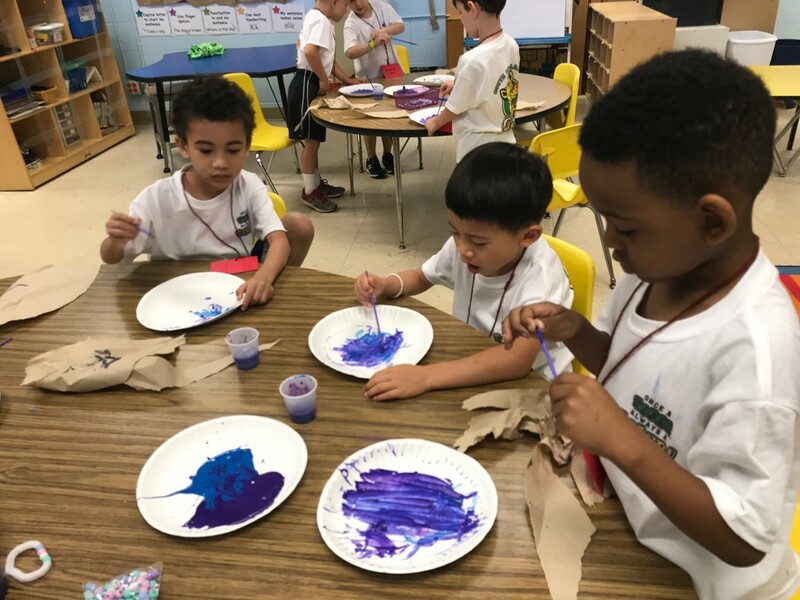 Tiger Cubs dabbled in art as part of their SHM summer camp experience. Mrs. Harris gets to know her newest Tigers at Cub Camp. Ms. Scott and Stripes welcome Kinder Cubs to SHM. I cannot believe the school year is over! 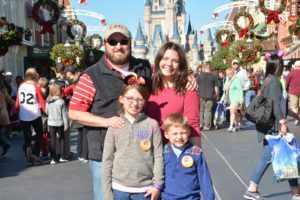 As my time as PTA president wound down, I found myself thinking back as to how I got involved with the PTA to begin with, some six years ago, and how that led me to volunteering, then chairing a committee, subsequently serving on the board and ultimately being named PTA president. I concluded, I initially began volunteering because I know that no one can do everything, but everyone can do something. (And, my children enjoyed having me involved with their school.) I continued to volunteer at different PTA events and activities because I know that great things are brought about and burdens are lightened through the efforts of many hands anxiously engaged in a good cause. (And, I enjoyed working with our students, faculty members and fellow parents.) I eventually agreed to volunteer to be president because I enjoy seeing firsthand PTA committee members and South Highlands staff members who are excited about the programs they are helping to lead and/or create, and I wanted to be instrumental in trying to help them make a difference in not only my own children’s but others’ elementary school experiences and educations. Now, I hope as you read my reasons for volunteering, it inspires you to think of some of your own reasons to either get involved or stay involved with the PTA. Also, if you have ever thought about becoming more involved, I sincerely hope that you will take the opportunity to do so next year or in the years that follow. One of the greatest gifts you can give is your time, and I find there is incredible value in being of service to others. 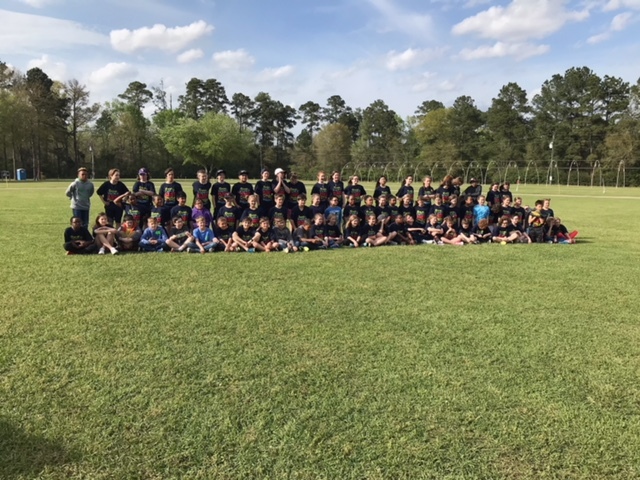 We have had a great year as a PTA this past school year, and I would like to take this opportunity to thank each and every South Highlands family member who helped make our PTA-sponsored activities and endeavors a success. 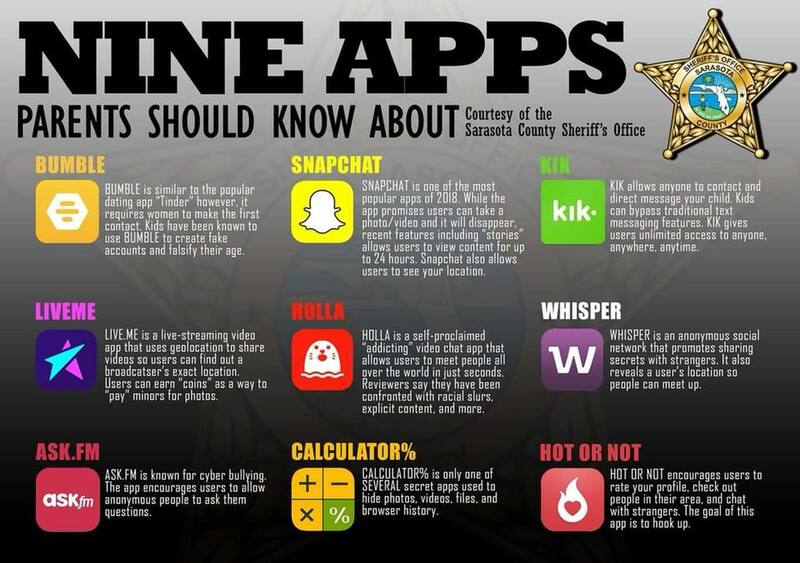 Some of you gave your time, some of you donated money, some of you attended fundraisers and some of you did ALL of these things. (I continue to be in awe of the generosity of our South Highlands parents.) I want to personally thank all those moms, dads, grandparents and extended family members who took time out of their busy lives to volunteer in ANY way over the past year. Volunteering is oftentimes a thankless job, but I want you to know that you are very much appreciated. Without your assistance, many of our PTA events and day-to-day school duties could not have happened. I also want to extend a sincere thank you to my devoted PTA Executive Board – Emily Welch, Mandy Metrejean and Catherine Hunter along with Principal Mary Harris. I am lucky to call you all friends. Moreover, South Highlands is lucky to have you and benefit from your dependable loyalty, steadfast commitment and the countless number of hours you each so kindly give for the betterment of our school. Together we managed to improve on several existing PTA events and founded new positions with the implementation and execution of the digital Friday Sheet (Tiger Bytes), the South Highlands Garden, South Highlands Shares and funding for the new After-School Arts Academy. We accomplished much together, and I couldn’t have done it without your unprecedented support and trusted guidance. Thank you again for your confidence in me and your unwavering support. You are true gems. As I alluded to above, neither I nor the board can take full credit for all the good the PTA was able to accomplish this past year. The credit belongs to the large, hard-working, passionate and dedicated group of PTA committee chairs: Cori Anderson, Tricia Frierson, Jeanine Matthews, Laura Singletary, Courtney Smith, Monica Norwood, Angela Vinet, Katie Elliot, Sam Thiemann, Carolyn Gonzales, Katie Simpson, Tammy Logan, Kristi Carr, Valorie Lurry, Carrie Rogers, Anne Furlong, Claire Rice, Celeste St. Amant, Helen Richard, Abbie Nida, Emily McDonald, Cassidy Rainwater, Ginny Nolen, Amber Free, Casey Thompson, LeighAnn Thompson, Brandi Hart, Emily Welch, Molly McInnis, Christy Wreyford, Kathy Palmer, April Willis, Madeline Kawanaka, Brandy Adams, Rachel Penwell, Tracy Jones, Shannon Crawford, Jessica Miller and Sarah Teague. Thanks to ALL the committee chairs and their respective committees for doing such a fabulous job this year and providing an invaluable service to our school. You all have earned a special place in my heart by helping me to have had such a wonderful experience leading the PTA, and I am eternally grateful to you all. You are an amazing group of dedicated moms and your roles as PTA committee chairs are critical to the PTA’s success, and I owe each one of you a HUGE heartfelt thank you for not only agreeing to serve this past year when called upon, but in doing so faithfully and giving of your time and resources in such a selfless manner. Thank you again for the opportunity to help you give to a school that deserves to grow and continue to prosper with your continued participation and the participation of others like yourself that will step up to lead and serve in the future. And, for those who have served on the PTA and are leaving, I would like to wish you well, wherever you may be headed, and want you to know that you will be missed. Thank you for all your time, effort and selfless dedication over the past year(s). In conclusion, as I move from president to “past president” in June, I am pleased to hand the reigns over to the extremely capable Emily Welch as she prepares to take on the leadership role of PTA president for next year and wish her much success — even though I know of no one more equipped for the job at hand. I have no doubt that Emily will help the school flourish with her boundless determination, creative ideas and resourceful nature. Although, I assure you this is not farewell for me. 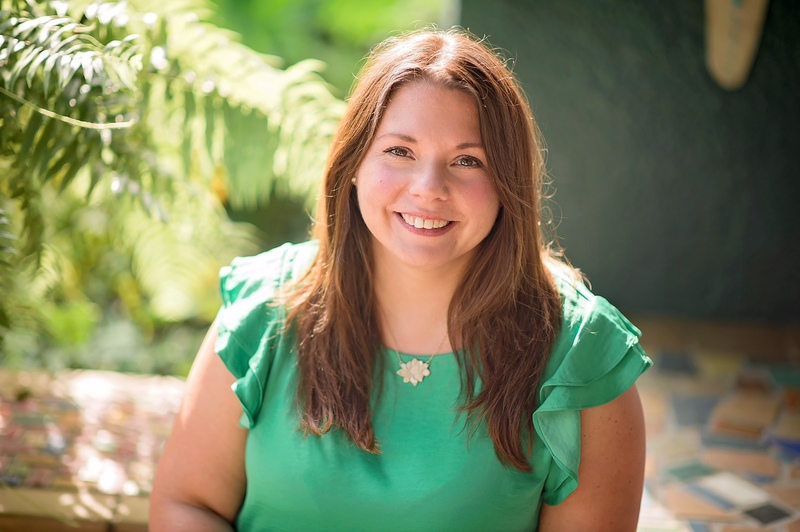 I plan on continuing to help out where needed and being available to offer support and guidance in an advisory capacity to Emily and the new team of PTA chairpersons and volunteers. THANK YOU again from the bottom of my heart to all of you at South Highlands for the opportunity to serve as your PTA president and lead this tireless organization for the past year. I’m not telling you it was easy, but it was incredibly worth it. I wish everyone a delightful summer, and I look forward to the fantastic things our school and the PTA have in store for next year and the years to come and the continued opportunity to volunteer, imagine and be a part of it all. 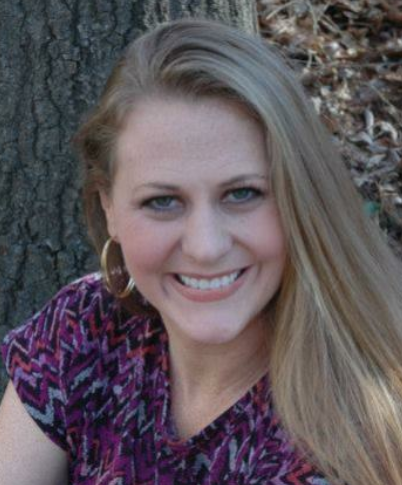 FROM THE INCOMING PTA PRESIDENT: Hello! 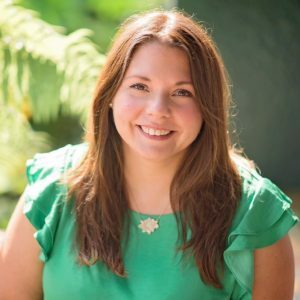 My name is Emily Welch, and I am the PTA president for the 2018-19 school year at South Highlands. Next year, I will have 5th- and 2nd-graders at SHM. The executive board has some fun activities planned to encourage school camaraderie and further parental involvement. We’ll be working hand in hand with the Foundation and the Athletic Foundation. I look forward to serving South Highlands in this capacity, and please feel free to contact me with any questions, concerns or comments. It’s going to be a great school year! 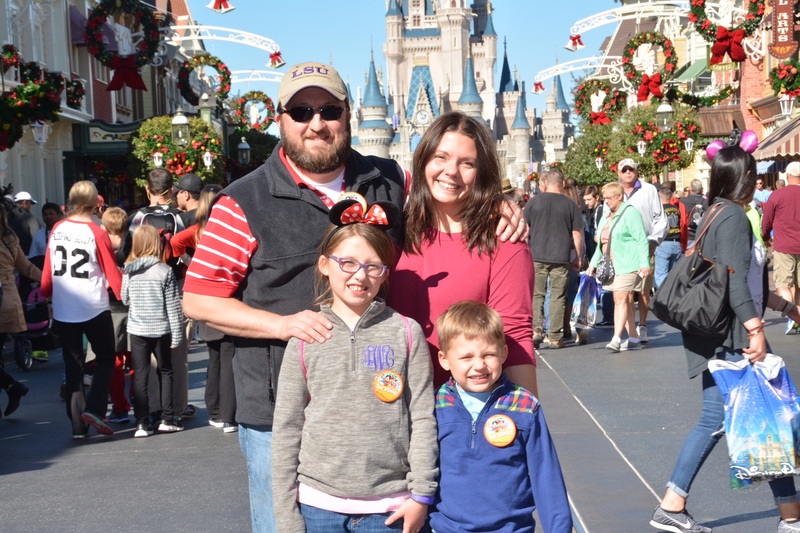 Meet new PTA President Emily Welch’s family: husband Johnny, daughter Audrey (fifth grade) and son Jackson (second grade). The courtyard cleanup and flower art set the scene for a warm South Highlands welcome to Kindergarten Roundup. 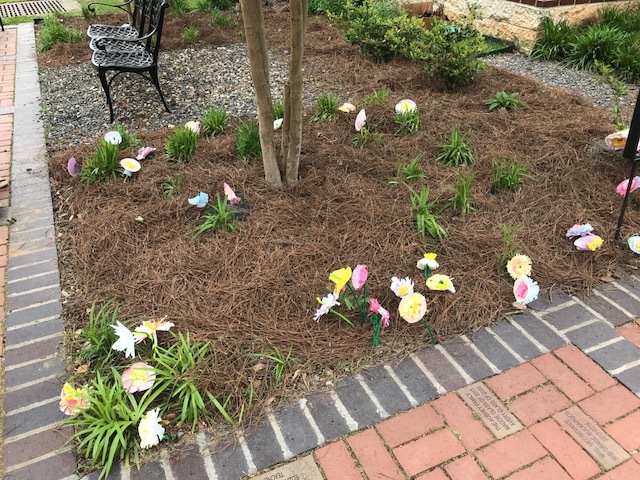 Kindergarten flower art lined the walkways welcoming new Tiger families to Kindergarten Roundup. The South Highlands Foundation had a great year this year! With 107 memberships, we were able to purchase 90 Chromebooks and seven SMART TVs. With your support, the students were able to get through online testing faster and on familiar devices (Chromebooks). The teachers and students continue to utilize their SMART TVs. 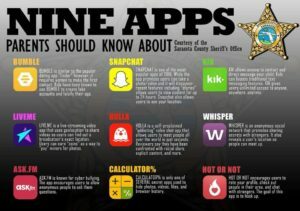 These are essentially interactive chalkboards used to facilitate instruction through the use of technology such as ELMO (modern day overhead projectors), educational sites and videos. The South Highlands Foundation is also very excited to be able to assist the school in purchasing a program called the MicroSociety. This is another initiative to keep the students engaged and help them understand the usefulness of what they are learning by integrating “real world” concepts and infrastructures. There is plenty to look forward to next year, and we could not have done it without your support! Remember, the membership campaign begins at the start of school and runs through October. We also offer great advertising opportunities for your business through our sponsorships, which provides families a return on their investment in their child’s education. If you would like more information, please send an email to jenniferveluvolu@yahoo.com. Also, mark your calendars for the Tiger Trot 5k and Fun Run March 9, 2019. We have some fun new activities in store! Lastly, be on the lookout for the next grounds/courtyard cleanup date before the start of school. 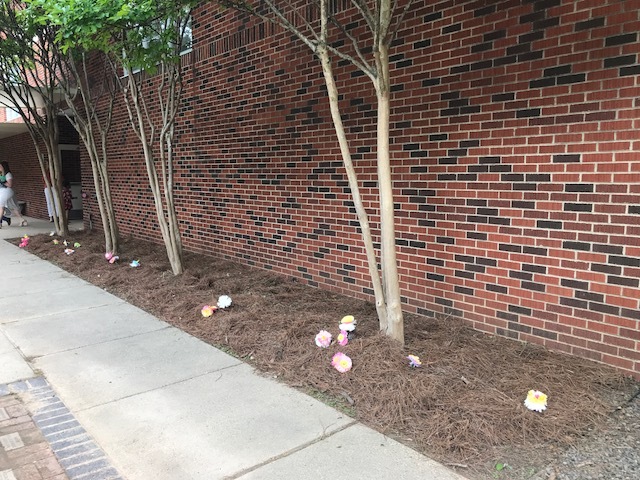 It’s a great way to connect with other South Highlands families while beautifying the school. 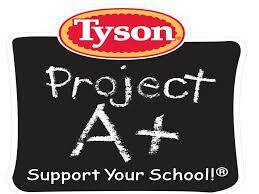 Again, thank you for your support of our children, teachers and school. Have a great summer! 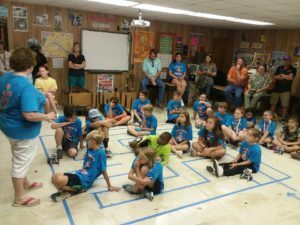 Robotics campers wrapped up their two-week camp with a Show and Tell demo for parents and visitors. Teachers Melissa Shaw and Lauren Woodward guided the third- through fifth-graders through the annual summer camp. Tiger family members planted a poplar tree on campus in honor of the inaugural year of SHM’s gardening program. 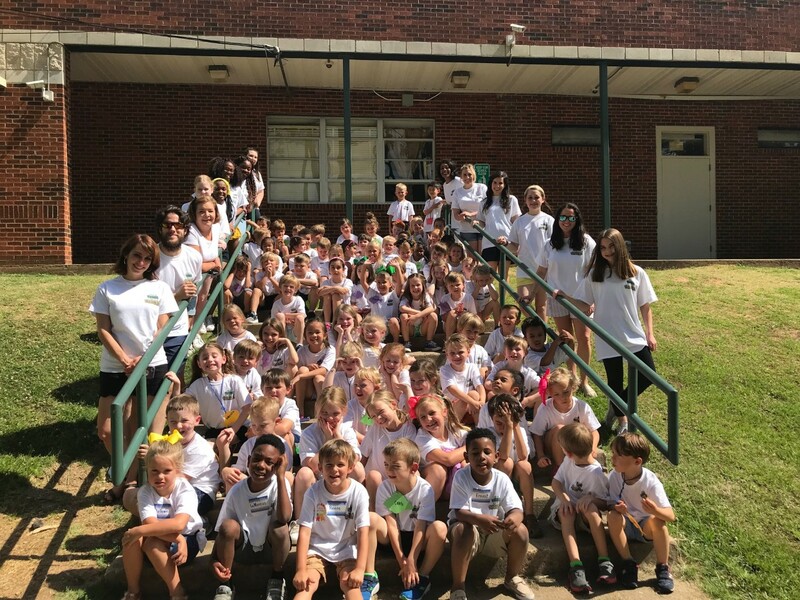 The 2017-18 fifth-grade block members were the first graduates of the program. 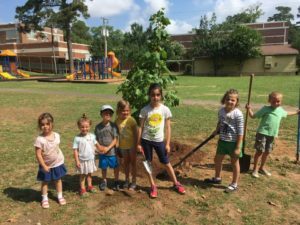 South Highlands families planted a tulip poplar on campus. 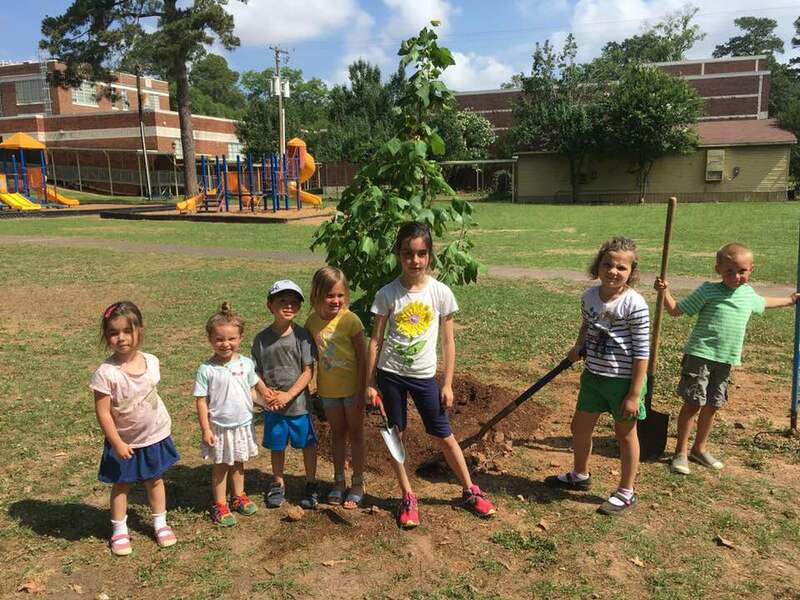 This tree was planted to commemorate the first year of the South Highlands Gardening Program and our fifth-graders who worked so hard before they graduated. Thank you, fifth-grade gardening block. This tree can grow to be 150 feet tall and will be the perfect shade tree for the southern sports field. It is also a host plant for Eastern Tiger Swallowtails and has beautiful flowers for hummingbirds and pollinators. It’s harvest time for the basil, dill, mint and tomatoes planted by SHM gardeners this school year. 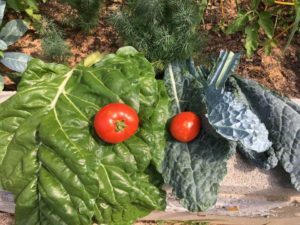 South Highlands school gardeners should all come pick and see what your plants are doing. 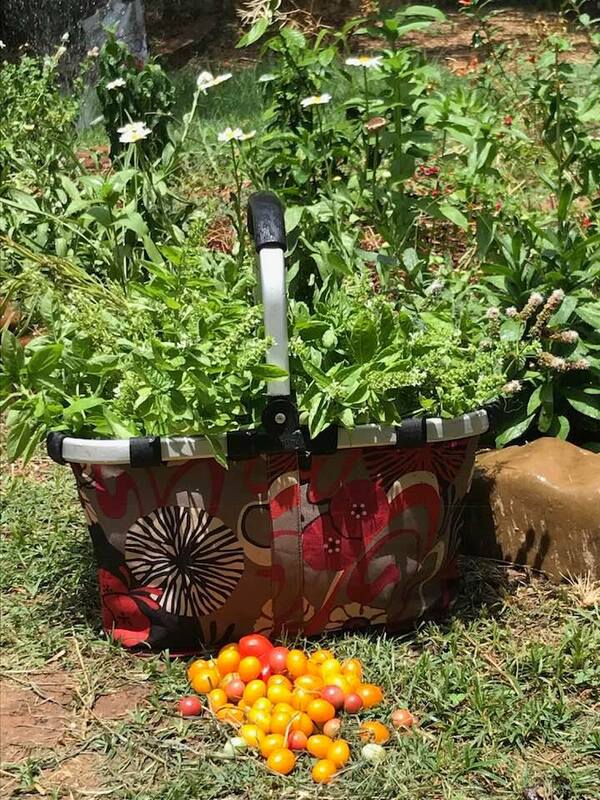 Basil, dill, mint and tomatoes — Next year we will have even more. 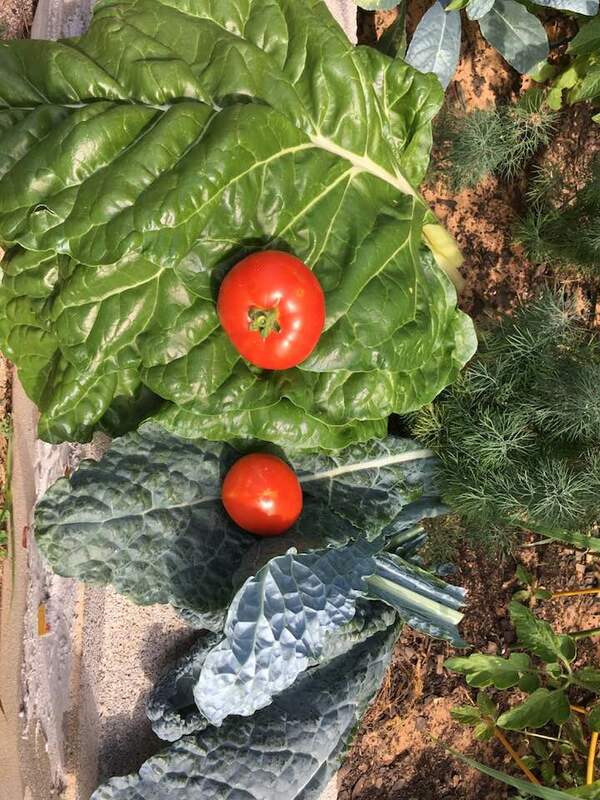 Neighbors are also welcome to come by and pick as well. The fourth nine weeks of school at SHM was a busy time for the fifth-graders. 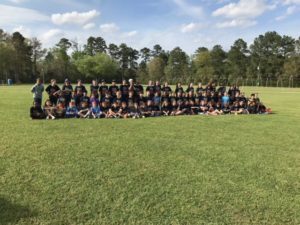 In March, the students, teachers and parent chaperones boarded buses and headed to Galveston and Houston for the Fifth-Grade Trip. They visited Texas A&M Sea Camp, Moody Gardens, NASA and Mission to Mars at the Houston Museum of Natural Science. It was an exciting learning opportunity for everyone. On May 9 and 10, the Fifth-Grade Class performed three amazing productions of “Peter Pan, Jr.” under the direction of Mrs. Raines. 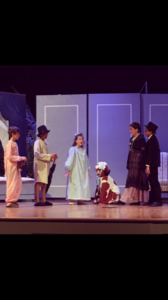 Fifth-graders were involved in all aspects of the production, from acting to stage crew to even running the sound booth! The cast of “Peter Pan Jr.” present their final play as SHM students. Students enjoyed a whole day of fun and games at Fifth-Grade Celebration Day held May 14. Activities included breakfast, “Minute-to-Win-It” games, time capsule wrapping and decorating, and outside free time on the playground, including nine square. There was a surprise visit from Sweetport, the fifth-grade video and the “Guess the Baby” game. 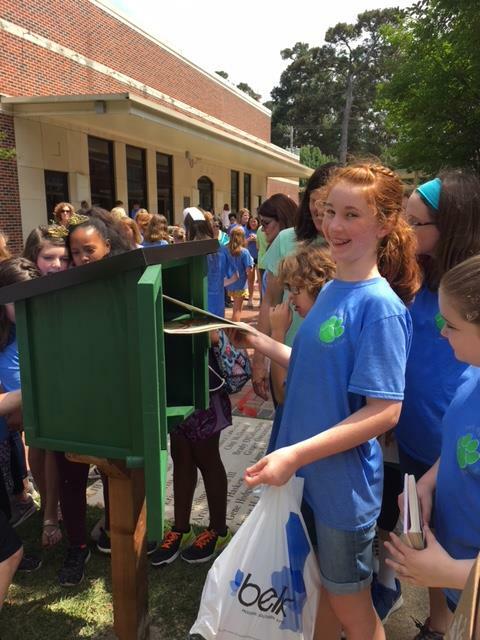 The day ended with a special ribbon-cutting for the fifth-graders’ gift to the school — a Little Free Library in the PAC Courtyard with a plaque including each of the fifth-graders’ names. The Fifth-Grade Class of 2018 hopes all SHM students, friends and neighbors will enjoy visiting the Little Free Library for years to come! Kathryn Haddock donates books to the new Little Free Library on campus. 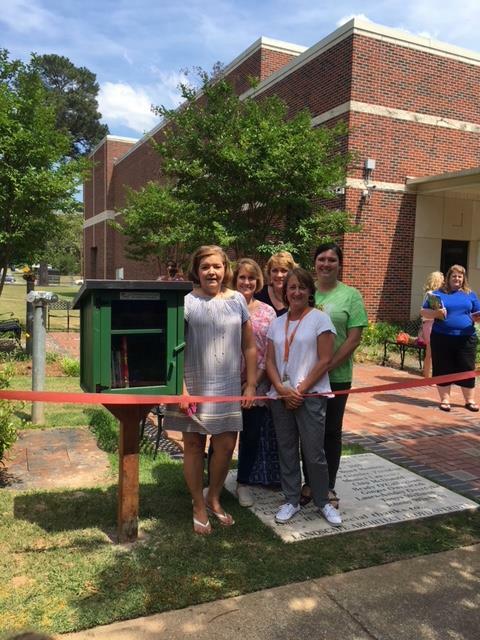 Mrs. Harris and the fifth-grade teachers cut the ribbon for the new addition to the courtyard, a Little Free Library, presented as the class gift. Graduation was held at 9 a.m. May 16. The fifth-graders were cheered on by teachers and grades K-4 as they made their final walk through the school to the auditorium for the event. Many students were recognized on that special day, including Mitchell Peters who was presented with the Spirit of South Highlands Award. Mrs. Parker was honored for her 25 years at SHM, 12 as a paent and 13 as a beloved teacher. She will be greatly missed as she retires! The End-of-the-Year Party was held after graduation at Party Central. The students enjoyed one last afternoon of fun and games with their classmates before summer started. Thank you all so much for your Box Tops submissions! South Highlands received a check in December for nearly $850. We just finished our Spring Box Tops collection drive and earned $512. 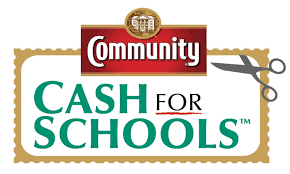 Our top contributing classes were Mrs. Randel (1,237 Box Tops), Mrs. Allen (882 Box Tops) and Mrs. Woodley (854 Box Tops). 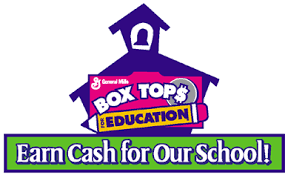 We are always collecting, so continue to clip, save and turn in your Box Tops! Thank you! We raised $26,000 to help the needs of our incredible school! Special thanks to all the SHM-owned businesses that donated goods, experiences or products to the auction! 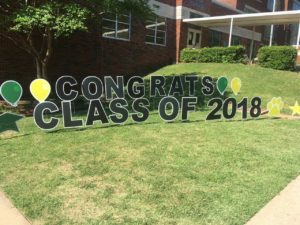 Fifth-graders were sent off in style Graduation Day. 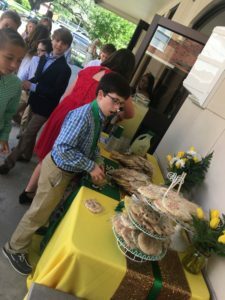 Graduates celebrate the end of fifth grade with refreshments provided by the Hospitality Committee. As we wrapped up our last hospitality event of the year, Fifth-Grade Graduation, we wanted to say thank you to Amber for trusting us to get the job done (and helping us!). It was a fun and rewarding experience. Thank you to our committee – Carrie Rogers, Anne Furlong and Claire Rice. You ladies have been incredible to work with and made everything run so much smoother. Can’t wait to kick off the 2018-19 school year with a little fun for the teachers and staff! See you in August! Mrs. Smith, Mrs. Parker, Miss Woodward and Mrs. Camden gather ’round the campfire at Camp SHM. 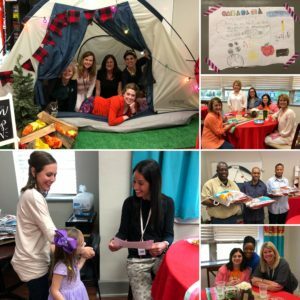 Faculty and staff went glamping to celebrate Teacher Appreciation Week. What a wonderful week our teachers and staff at South Highlands had April 9-13 during “Troop SHM 2018 Gone Glamping” Teacher Appreciation Week! Teachers have a HARD job, yet they do it with so much grace and love, which is why TAW is one of our very favorite weeks all year – we love showing them a small token of our great big appreciation for them! Thanks to the generosity of our parents and community partners, we were able to provide breakfast, lunch and special treats each day. 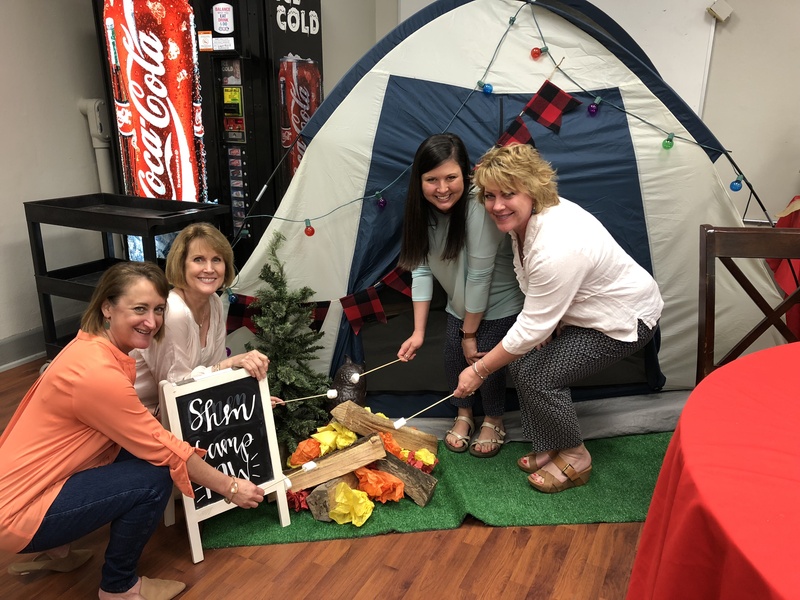 The teachers’ lounge was magically transformed by the talented Amber Ballis into a fun glamping zone, complete with a tent, s’mores, twinkle lights and even a teepee! Breakfasts included a Panera Bagel Bar, Yogurt Parfait Bars, South Highlands’ famous Cinnamon Rolls, a Muffin and Fruit Bar, and an amazing Maple Pecan French Toast Bake donated by Rachel Reeves. Our delicious lunch lineup included Taziki’s, jambalaya from East Ridge Country Club donated by Molly & Kyle McInnis, poboys from Herby K’s donated by the Doe family, a Chili + Baked Potato Bar donated by SHM families, pastas from Giuseppe’s PastaCaffe donated by the Brucia family, pizzas from Papa Murphy’s donated by the Flurry family, and the famous burger bar from Windrush Grill. Desserts and drinks were provided each day by generous SHM families. Amy Dunman sent teachers home with delicious chocolate swirl cookies and provided a gift certificate for 2 dozen of her decorated cookies to one lucky teacher. Third-grade Gateway teacher Katie Little was the winner of our cookie raffle! As an extra special treat, the Flurry family also donated Papa Murphy’s gift cards for the teachers and staff. To spoil them a little bit more, we provided a take-home meal for everyone, which included a pan of chicken spaghetti, brownies and French bread. Special thanks to Ms. Gaddison in the SHM cafeteria and Ms. Lena for cooking the chicken spaghetti! We wrapped up our week by giving each of the 50 teachers and staff members a gift card to one of their favorite restaurants or stores. Thank you to each and every one of you who responded to our plea for help with a great big YES! We depend heavily on the generosity of families and local businesses to provide the food so that the bulk of the TAW financial donations received can be used to purchase generous gift cards for our teachers and staff. Thank you to every single one of you who sent in a donation!!! We would also like to thank all the parents who covered the teachers’ lunch duty and recess so that they could come enjoy lunch in the Troop Headquarters! Our teachers and staff had an amazing week thanks to YOU! As the calendar turned to May and the last few days of school quickly approached, I began counting down the days with my kindergartener, Tilly, on our ride to school one morning. “Only seven more days of school until it’s summer!” I told Tilly in my most excited voice. I awaited her shared excitement, but she stared out her window in silence. I explained to her that summer was a good thing — something students and teachers alike looked forward to. So why wasn’t she excited about the fun summer plans stretching out before her? I quickly promised her that we would set up some play dates and surely get to see some of her friends around town this summer. Here we are, several weeks into summer, and Tilly has already written six notes to her classmates (and scolded me repeatedly for not mailing them yet!). This conversation with Tilly revealed to me everything I needed to know about her first year at South Highlands. She made wonderful friends. Not just kindergarteners either. I was surprised many days this year to see Tilly had formed friendships with other girls in third and fifth grades. I love that she had the opportunity to thrive in a very sweet kindergarten bubble but also gained a sense of community from the larger student body and older students who lead by positive example. She never hesitated to hop out of my car in the morning and never returned to me in the afternoon with anything but a smile on her face – and that is no exaggeration. 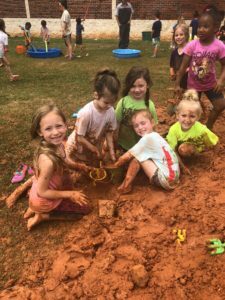 Eighty-plus kindergarteners crawling on a mound of dirt resembles something like an ant hill – constant motion with the single goal of getting as dirty as possible! At the end of Mud Day, many kids hugged goodbye to friends and signed off from school for the summer. But not my Tilly. No matter how hard I tried to convince her that attendance would not be taken on the last day of school. No matter how much I explained to her that Mrs. Reeks had to pack up her entire classroom and could certainly benefit from the extra work day. No matter how effectively I persuaded her that she could miss if she wanted, this kid wasn’t going to budge. If the carpool line was running, and students could be at school, Tilly wouldn’t be staying home. Needless to say, this first year as a South Highlands Tiger has been wonderful. I am grateful for this magical place where my daughter gets to learn and discover for five more years. And now, weeks into our summer vacation, we’re counting down again. Only __ more days until we’re back in school! 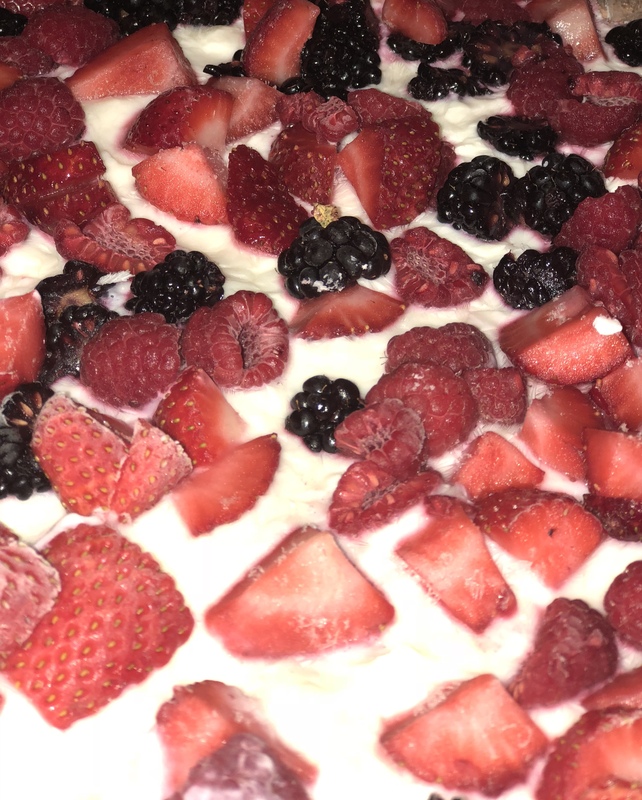 Cool off this summer with a frozen yogurt treat topped with fresh berries from the Farmers’ Market. 1. Line large baking sheet with parchment paper. 2. Pour the yogurt on the baking sheet and spread with a spatula to level. 3. Sprinkle with chopped fruit and berries and freeze for 3-4 hours to overnight. 4. Remove from freezer for 3 minutes, chop into bark, drizzle with honey and serve. Otherwise, the bark can be wrapped in plastic wrap and stored in the freezer for up to 2 weeks. * Recipe can be modified with your favorite fruits. Also makes a great topping/side for breakfast oatmeal. Be on the lookout for 2018-19 PTA dates. For more information, visit the SHM PTA website. The 2018 Louisiana State Convention was held in conjunction with the National PTA Convention June 21-24 in New Orleans. Stay tuned for all the announcements/updates. WE’LL SEE EVERYONE AUG. 13!